What Would Brian Boitano Stew? 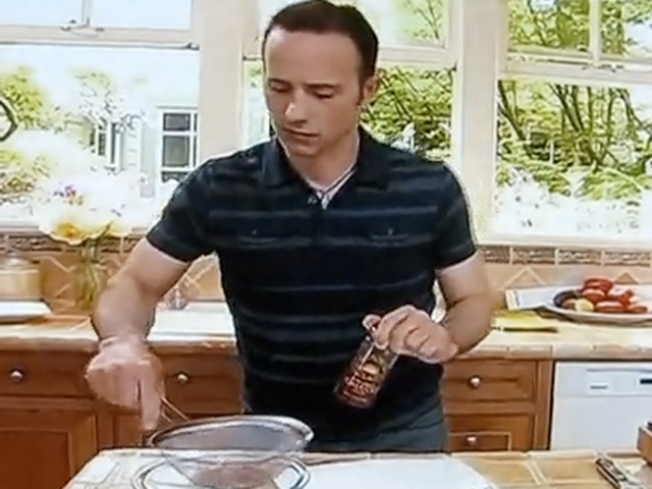 Brian Boitano has an odd way of showing his love for cooking. Is it possible that the new Brian Boitano cooking show is even more ridiculous and more terrible in reality than in theory? The first episode of the show, "What Would Brian Boitano Make," actually featured the following bits of sublime misfortune: the Sunnyvale, Calif. resident biking behind rainbows, Boitano lounging in a velvet robe, and Boitano running from an animated goat cheese log. Oh, and there's video too. Boitano described his own show as "goofy and funny" but his humor is hard to figure out. The show starts with a rendition of the infamous South Park spoof song, "What Would Brian Boitano Do?" The show features Boitano cooking for a party, which in Monday's episode was a bachelor party with a twist. The skater served up food and 15 bachelorettes for his friend. Actually want to watch this show? Tune into the Food Network on Sundays at 1 p.m./noon central.